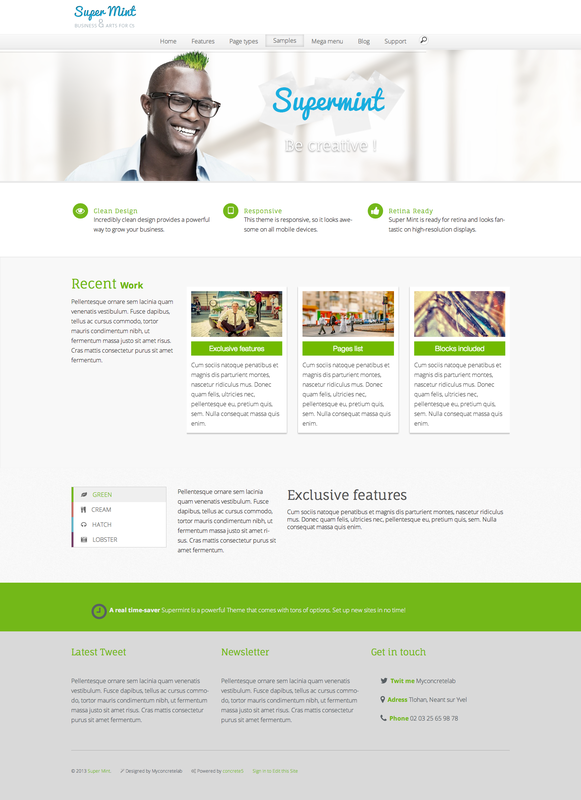 Supermint is a theme made for business, eCommerce, portfolio... In fact Super mint makes for tons of usages. Just take a look to reviews to understand that Supemmint is probably the best theme for Concrete5 with a really sweet client support. 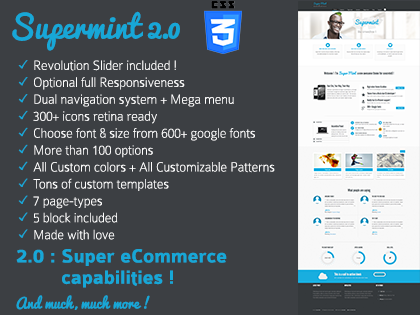 For eCommerce Addon, Supermint include a category navigation, responsive product list, responsive product details, zoom on image and more more exiting stuffs. A powered mega-menu let you create and structure rich content into your navigation. More than 100 options throught a unique option framework let you manage each details of your theme without any code typing ! 7 really reative page types ! Add Blocks into header and drive into a responsible slider that can contain everything you want. Choose between three structure of sub navigation on each page to fit exactly the need of your clients. With the new advanced double tab technologie you will live the nicest mobile experience. Manage ALL colors, manage ALL pattern for the website. A Awesome Responsive Slider included ! A link to download the archive will be sent to you once the purchase of Supermint has been made here. Although you need to install it by yourself, the installation process is well documented. This slider, adapted for Concrete5 by BeConcrete, is found on the Envato market place. The original version of the slider is found here: Revolution Slider. Important : This Revolution Slider package is not from Concrete5 official marketplace. Concrete5 is not responsible for this slider package. Easy accordion and easy tabs is not included in the theme but in the Bundle.